We will back at 17:30 GMT on Sunday, with live text commentary of what promises to be a thrilling final. Thank you for joining us, and hope you enjoyed it as much as we did. See you soon. Bye for now. What a match. The best of the tournament. And Roger Federer has to do it all again inside 24 hours. The final tomorrow sees the world number one Novak Djokovic against the world number two. It begins at 18:00 GMT. Make sure your schedule is cleared. Here's Roger Federer: "I think I got lucky tonight. Stan played better from the baseline and that usually does the job on this court. But I kept fighting. It's tough but I'm thrilled to be in another final in London. "Novak is playing great tennis. It usually brings the best out of me, it's going to be tough but I'll give it a shot." "Poor old Stan Wawrinka. He could not have done any more. He threw the kitchen sink at Federer and even served and volleyed. He leaves the arena to a standing ovation." What resistance shown from Roger Federer. He had to save four match points, but somehow he has held on and booked his place in the final. Wawrinka looks absolutely devastated as he trudges off the court. Djokovic versus Federer tomorrow in the final. Make sure you do not miss it. Federer is closing on a ninth appearance in the final of this event. A delicate drop shot takes him to within one point. Fourth match point for Wawrinka. But it's a big Federer serve down the middle and Wawrinka's return goes long. Another missed opportunity. How many more chances will he get? But Wawrinka holds on. Back on serve in the tie-break. A passing shot down the line, is in by a quarter-of-a-ball's width to take Federer 4-2 ahead. He needs three more points for a place in the final. Federer dominates the net to move 3-1 ahead in the tie-break. A scorching shot finds the corner from Wawrinka and the advantage is lost. First mini-advantage for Federer. And Wawrinka, who nets with a backhand, looks in pain as he clutches his thigh. "Wawrinka deserves to find himself in the tie-break. It was a brave hold and it will be interesting to see how this goes." Federer two points away from victory, but Wawrinka fights back from 15-30 down to win the next three points. Tie-break time. "Wawrinka is going to have to call on all his inner strength to hold here." Federer leads. What drama in the O2 Arena in London. Wawrinka, who had three match points to move into the final, is now serving to save the match. A backhand winner down the line, followed by a forehand cross-court winner gives Wawrinka 0-30 on Federer's serve. An unforced error from the world number two, dragging one wide, gives Wawrinka two break points, which Federer then saves. We may be here for a while yet. Stan Wawrinka is going to have nightmares about this match for a long time if he does not win it. Three times he was on match point on his own serve. Three times he failed to get over the line. Federe then breaks his serve in a thrilling and dramatic game. We are now back on serve. Federer breathes again. "There are people bowing to Roger Federer in the crowd, waving flags and high-fiving each other." That's three match points saved from Federer. Wawrinka saves a break point, and hauls it back to deuce after a 21-shot rally. He then has his second match point with a volley at the net. Federer can't get there and hits his chair with his racquet. One more point for glory. But wait. A volley at the net would normally be routine for Wawrinka. Match point against Federer is not a normal situation and Wawrinka punches it into the net from close-range. First match point saved. Wawrinka opts to serve and volley on his second serve, but it does not work as Federer passes with ease. Federer forces the error from Wawrinka, who pulls a forehand wide for 30-30, but Federer hits the top of the net for 40-30. Match point for Wawrinka. Warinka wins the first point, but loses the second. 15-15, then 30-15. Two points for victory. "It's going to be interesting to see how the crowd support each player when Wawrinka comes out to serve for the match. Do they try and raise Roger Federer? What a moment this is for Stan. He's nerves will be tested against his friend." Federer keeps it interesting by holding his serve. There had been a delightful rally with both players volleying while close at the net, but Federer eventually maintains the pressure on his opponent. But Wawrinka is now serving for the match. Can he hold his serve and nerve? Wawrinka has never beaten Federer on any surface apart from clay. "I think we'll see Wawrinka try everything and anything to break here because it will be uncomfortable trying to serve out for the match." A break point for Federer after an epic rally. He just does not know when he is beaten. But he drags a cross-court forehand wide of the target. not by much, but it is out. He looks to the heavens as that was a great chance, but instead we are at deuce. Federer than has another break point with a powerful smash. Wawrinka is reduced to throwing his racquet at the high bouncing ball. But Wawrinka for the second time saves the danger, before winning the game. The world number two needs perfection from now on. He is serving to stay in the match. "Federer has not been sure what tactic to use. He's tried lots of different things and has just about stayed in the match but Wawrinka has been the better player." Roger Federer is still chipping away at the umpire after the controversy at the start of the set. Let it go, Roger. Let it go. "You wonder if Wawrinka is starting to think about the position he is in." The frustration is getting to Federer. He loses a long rally. Once the point is over, he smashes a bouncing ball into the stand. The six-time season-ending event winner is under pressure in what is now the longest match of the week. But like all champions, he shows his fighting spirit by recovering and forcing Wawrinka to go long with his forehand. Advantage Federer then becomes game Federer. An absolutely fantastic match. "Federer was deep in thought after he missed that last shot. He's probably trying to steady himself but one thing is for sure he won't give this match up." A rare error from Federer, and it could prove costly. An overhead smash, close to the net, goes wrong and that helps Wawrinka take his service game, without the world number two winning a point. Wawrinka has only beaten Federer twice in 16 matches. He needs two more games for his third victory. Facebook questions to former British number one Tim Henman. Jennifer Wyatt: "As a tennis fan, who is your favourite player, and why?" TH: "I've probably got three of all time. Bjorn Borg was my favourite when I first got interested in the game. Stefan Edberg was then a hero of mine when I started playing professionally - I was lucky enough to practice a lot with him because he was living in London. Now my favourite player to watch is Roger Federer." "Huge hold for Federer. How important that second serve was at 30-30. He went out wide when most people would have gone for a safer option. That's why he's a champion." But nothing is going to be handed to Wawrinka. His Davis Cup team-mate is doing everything he can to stay in the match. Federer again holds his serve. The deficit is again reduced to one game. Wawrinka does enough again. He is managing to do enough to hold onto his lead, and once again his serving his been emphatic. He restores his two-game lead and inches closer to a place in the final. He lost to Novak Djokovic in the semi-finals last year at the O2 Arena. He may well be getting his chance for revenge. Just what Federer needs to regain his composure after the earlier controversy - a routine hold of serve. He is still a break down in the third, but at least he looks a bit less angry than he did five minutes ago. An international footballer in the crowd for you to guess. Full marks for those who recognised Real Madrid's James Rodriguez watching on. Federer's mood gets even worse when Wawrinka holds his serve in the second game. Suddenly Federer is looking vulnerable. "It's a long time since I've seen Roger as agitated as that. But it's important that Wawrinka keeps his nerve and builds on the break of serve." All good matches need some controversy. Federer is unhappy at an over-rule by the umpire at the start of the third set. It seems to throw Federer off his stride as well, as Wawrinka break. The first point of the set went in favour of Wawrinka, whose cross court shot was called out by the line judge. The umpire immediately over-ruled and called 0-15. Federer did not hear that and only realised when he lined up to serve at 0-40 that the first point had gone against him. He argued with the umpire that he would have challenged his over-rule had he heard. TV replays show Federer would have been right to challenge. "You just sensed towards the end of that set that Federer was holding on his own serve quite easily and there was not a lot of time for Wawrinka between his service games. "It's what we wanted though, a third set. Or a one-set shoot-out to see who plays Novak Djokovic on Sunday." 30-0 to Federer on Wawrinka's serve. The server then smashes an overhead attempt into the net to give Federer three set points. An attempted cross-court backhand only hits the top of the net from Wawrinka and it is one set each. And what a match. A contender for the best of the tournament so far. But Federer doesn't let anything slip through his fingers. His service game is fine, and takes us to 6-5. Once again Wawrinka is serving to save the second set. A poor sign for Tottenham fans. BBC Radio 5 live sports extra commentator Leon Smith reports that a stray shot heads in the direction of reserve Spurs goalkeeper Brad Friedel. The American is among the O2 crowd, but spills a catch that heads his way off Wawrinka's racquet. Some more stats for you. Wawrinka has only got 40% of his first serves in play, but has then lost only two points when doing so. He also leads the aces count, by 7-3. He holds his serve in the 10th game as the prospect of a tie-break gets closer. That is 10 consecutive holds of serve in this set. "Roger needed a straightforward service game. He can now apply a lot of pressure on Wawrinka's service game. Wawrinka knows he will have a lot of pressure on him. His first serve percentage is still poor and he's been relying on slightly sloppy return of serves from Roger. I'm pretty sure he won't get that from Roger in this next game." Back to matters in London. Wawrinka at 40-0 down, wins his first point of the game with his fifth backhand winner of the match, but that doesn't phase Federer, who takes the next point. Wawrinka is now serving to stay in the set. question and answer Facebook session with former British number one Tim Henman. Jonathan Dixon: "Looking ahead to next season can you see Nadal winning the French Open for a 10th time or will his injury problems mean someone else will be favourite even though clay is Nadal's best surface?" TH: "I still think Nadal goes in as the slight favourite when he's won nine times before - it's an incredible achievement and it's a surface that I think he's more dominant on than any other player in history. "But with Djokovic having never won the French, that is going to be a huge motivating factor. Those are the two players to beat." "The longer this goes on, the less margin of error for Federer. One poor service game and his season could be over." Who is going to blink first in this set? At 30-30 on Wawrinka's serve, the door is slightly ajar for Federer to take advantage. But as soon as the opportunity comes, it looks to have gone. But wait. It is deuce - for the third game in a row. Another one for you stat fans. Unforced errors so far in the match. Wawrinka 21, Federer 14. But Stan's serving is getting him out of trouble and eventually helps him hold his serve. He leads overall, and it is 4-4 in a very tense second set. A full-stretch Federer just manages to get his racquet on Wawrinka's attempted pass. The world number two is pumped up, and screams out while punching the air. If both players play like this next week then Switzerland will take some stopping in the Davis Cup final against France. A 23-shot rally, while at deuce, gets a great reaction from an enthralled crowd. Before Federer holds again after an aggressive second serve of 106mph down the T.
Some serving stats for you. Wawrinka's average first serve speed is coming in at 129mph, compared to 118mph from Federer. "He had two massive serves to get him out of trouble in that game. It's amazing his serve percentage is so low at around 40% because it seems like he's serving well. But when he gets his first serve in, he wins just about every point." Wawrinka has won all but one point when he has got his first serve in. Federer goes into defensive mode, and it's like hitting against a brick wall. Everything Wawrinka throws at him, Federer returns. It is 0-30 on Wawrinka's serve, but another ace, his fifth of the match so far, gives him some momentum to fightback. Federer wastes two break points, but, after going to deuce, has another chance, which Wawrinka again saves, before holding. And it is a great hold from 0-30 and 15-40 down. We said we hoped it would be a high-quality encounter. It certainly is. Novak Djokovic said he would be watching and he must be enjoying both players tiring the other one out. I wonder if the Serb remembered the popcorn. "We are certainly seeing more net plays from Federer. It's something we'll see continue as this match goes on. And maybe he'll try to pull Stan into the net and test his skills and movement in that area of the court." Some straight-forward serve-volley tactics from Federer are seen in the fifth game of the second set. He has decided to charge into the net, just to give Wawrinka something to think about. Under pressure from a hovering Federer, Wawrinka slaps a backhand into the top of the net. It is tight and tense, with both players trying to out-think and out-battle their opponents. But it is making for a compelling encounter. An important, if unspectacular, hold from Wawrinka. He won't be telling his grandchildren about it while sitting in a rocking chair in 50 years time, but it is enough to do the job. 2-2 in the second. Another of Tim Henman's answers from our Facebook question and answer session. Emmacy De Paragon: Do you think Roger Federer can reclaim world number one? TH: It's very difficult for him with Djokovic's consistency right now. I think he's the player to beat. I think Roger can win a Grand Slam again but over a 12-month period to be number one is going to be very difficult. Now it is time for Federer to impress with his serve. After missing a chance to finish the game off when, while positioned at the net, he deflects a volley wide, the world number two then smashes down a serve, which Wawrinka can't keep in play. The second set remains on serve. "Stan will be a little bit thankful that he won that service game. He needs to get more first serves in, he needs to get his percentage up." Wawrinka's serve was formidable in the opening set, but early in the second he is struggling to get his first serves in. Federer has a chance at 30-30, before he completely misjudges a backhand. The ball bounces off the top of the racquet and flies high into the air. You won't see shots like that too many times from the 17-time Grand Slam winner. Wawrinka holds and we are level early in the second set. After Djokovic lost a set earlier today to Kei Nishikori, he then won the next one 6-0. Federer breezes through his opening service game of the second set and looks very focused. Let's see how good Wawrinka is now. Adam Street: Is Amelie Mauresmo the right coach to take Andy Murray's career forward? I can imagine that Lendl would have been more of an authoritative figure because the titles he has won and his personality. Is Mauresmo the right person to do the same? TH: It's difficult to say as they haven't really worked together for a particularly long time. Let's not forget that Murray won three of his last six tournaments at the end of the year, so the only person who has the answer to that is Andy himself. Where next for Andy Murray? So, before the second set starts, let's have a look at how Andy Murray recovers from his disappointing defeat by Roger Federer earlier in the week. BBC Sport has spoken to John McEnroe, Tim Henman and Mats Wilander to find out. Read the feature on the BBC Tennis page. I wonder what Andy Murray makes of Roger Federer's performance today, after being thrashed by the Swiss on Thursday. Murray's latest column on the BBC Sport website is well worth a read as he discusses his 6-0 6-1 defeat by Federer. "This year has been testing and I've learned a lot, it's just a shame to finish it with another very harsh lesson," says Murray. "There won't be drastic alterations to my game but it was not good enough, and even against the best players I should be giving myself opportunities to win games, sets and matches. "My goals remain as high as ever and the next target is already clear - to try and win the Australian Open." "This is what's great about tennis. 90% or more of fans would have said Roger Federer would win, me included. For whatever reason Stan has managed to come out and execute his game plan and it's a brilliant first set. "Much was built around the phenomenal serving but he's got to maintain that. I still think Roger is favourite. He was changing a few things towards the end of that set to try and break Stan's rhythm." The last service game from Federer saw a change of approach by serving out wide. Well he is not the only one who can mix it up. Wawrinka tries a different tactic - that of serving tight into Federer's body. And it works. After just after 30 minutes of the match, he has two set points. And he takes the first one after sending Federer sprinting around the court. Earlier today Novak Djokovic dropped a set for the first time this week. Roger Federer has just copied him. When asked what he would say to Wawrinka having gone from a 5-2 lead to 5-4, Leon said: "I'd remind him that you'd rather be in this position than any other. It's a great position. Then I'd say how did you get yourself in this position? You served great, were dictating play and exposing Federer's backhand. He's got to focus on his game and back it up with aggressive play to the backhand." And those in the O2 tonight are being treated to a thrilling match. Federer throws his serves out wide in the ninth game and it is a successful tactic as Wawrinka struggles to return any of the serves. The world number two has actually won more points than his opponent, who is again serving for the opening set. "It's interesting to watch Federer employing his match tactics. It's a good lesson for youngsters, to learn how to stop the momentum of your opponent. Dropping back behind the baseline and changing the height and pace of the return. A subtle change of pace can put them off." Federer wins the first two points off Wawrinka's serve, and then has two break points at 40-15. Wawrinka's first serve finds the net and he then goes too long. An immediate break back from Federer. So, who among you wrote him off? Never write Federer off. But he still faces a battle to save the first set though. It is not only singles action at the O2 Arena this week. There have also been two semi-finals in the doubles competition at the ATP World Tour Finals today. The pairing of Croatia's Ivan Dodig and Brazil's Marcelo Melo beat Lukasz Kubot of Poland and Robert Lindstedt of Sweden 4-6, 6-4, 10-6. Dodig and Melo will face the Bryan brothers, Bob and Mike. The Americans defeated the French duo of Julien Benneteau and Edouard Roger-Vasselin 6-0 6-3. "I'm so impressed by how Stan has come out here tonight, to be so loose and confident. I think Roger has been taken a bit by surprise. I don't think he expected Stan to start at this kind of level. It's almost unbelievable. He's playing smart, sticking to the game plan and from that he's taking it on and hitting winners from all over the court." Not only is he struggling with Wawrinka's serve, Federer isn't having much luck either. The ball clips the top of the net, but unlike Wawrinka's similar shot, which crept over a few games earlier, it drops the wrong side of the net. That brings about another break point for Wawrinka. But if the world number four had been a bit fortunate with the previous shot, there was nothing lucky about a beautifully-hit winner. Two breaks of serve. Wawrinka serving for the set. Federer in shock. "Spectacular serving from Stan. Power, accuracy and most over 130mph, giving Roger very little chance even though he's one of the best at getting the ball back in play. He's serving very well and that is enabling him to dictate points." Tremendous serving from Wawrinka. Who already has three aces. Federer is struggling to connect with them, never mind keep them on the court. A lovely backhand down the line, when Federer was expecting a cross-court attempt takes it to 4-2. Remember, Wawrinka has only won twice in 16 meetings between the pair. A routine service game is just what Federer needs to calm the situation down. And that is exactly what happens in the fifth game, although Federer is still one break of serve behind in the opening set. Wawrinka is looking more comfortable on court tonight than when posing with these enthusiastic fans earlier in the week. "I think Stan would be in the top five if they decided to have an arm wrestling competition, rather than play tennis one week. Rafa Nadal would win it though." A serve of 131 miles per hour, proves too hot for Federer, who can only send it into the net. But a wild backhand from Wawrinka, after the ball zipped up off the surface, takes it to 30-30. But again his serve comes to the rescue with another one of 135mph and it is soon 3-1. BBC Sport Facebook users. Here is one of his answers. Daz Plant: "With Liam Broady and Kyle Edmund making the finals of Challenger tournaments in the past few weeks to end the year inside the top 200, how would you rate their chances of challenging for the top 100 by the end of 2015?" TH: "It's a very realistic goal for both of them and I think they should set their goals high. I think what Brody has done very well is compete a lot. "I think he's played 32 or 33 tournaments this year and he's got some momentum going into next year - it's important he maintains that. Likewise, with Kyle I'd like to see him compete a lot more and if he does that and keeps improving there's no reason why he can't be top 100 by the end of next year." "We have a match. That's a big break for Stan. He stuck to his tactics, hitting deep heavy balls into Roger's backhand. It's the right tactic and he's got to maintain that but it's a good start from him." Wawrinka shows his early power with a delightful backhand shot to move 30-15 in front, before then going on to have the first break point of the match. Another blasted shot, this time a forehand, is too fierce for his opponent and Federer has his serve broken for the first time this week. 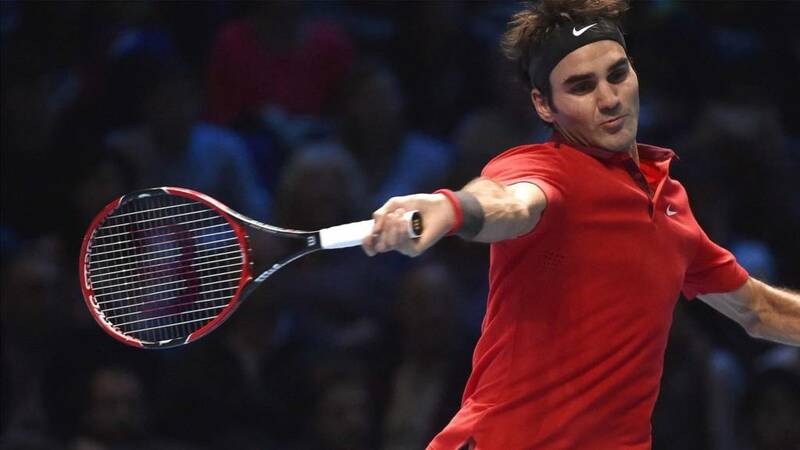 He has not lost a set in his three matches at the O2 Arena this year. He has work to do to maintain that record, but what a start from Wawrinka. Simone Robinson: Would love a Federer vs Djokovic final as have never been to a live tennis event - first tomorrow! Just so excited! Nuren Ahmed: Roger Federer vs Novak Djokovic is the final everybody wants to see. It will be a fitting conclusion and proper contest. "Stan will feel a lot better. At 15-30 it was looking a bit dodgy for him but he will feel good to get the early hold." We said it could be good. It is already. Wawrinka gets lucky when his shot clips the top of the net, and it is an early tester for Federer. He gallops towards the net and just gets there in time, but Wawrinka uses a deft touch to lob the ball back over his head for an exquisite winner. Wawrinka then holds when a Federer forehand is slightly wayward. "Federer is seeing the ball like a football. He's got that exhibition look about him." What a start from Federer. If he wanted to stamp his authority on the match quickly, he has done so in style with two blistering forehand shots that his opponent doesn't even have time to run for. The world number two has a routine hold to start us off. Novak Djokovic's three-set victory over Kei Nishikori at the ATP World Tour Finals in London. "Federer will be delighted that Wawrinka is playing himself into a bit of form with the Davis Cup coming up but he will want to win tonight, although he won't want to damage his Swiss team-mate's confidence." Novak Djokovic saw off Japan's Kei Nishikori in three sets to reach the final of the ATP World Tour Finals. The world number one, chasing a third straight season-ending title, came through 6-1 3-6 6-0 at the O2 Arena. Djokovic recovered his form superbly after reacting badly when the crowd in London applauded a double fault in the second set. So who do you want to see play Novak Djokovic in tomorrow's final and why? Can anyone stop the Serbian from winning the title for a third successive year. "I think 6-3 6-4 - Federer." That's the verdict of Swiss journalist (and my media room neighbour) Arnaud, although he points out that there is more on the line tonight with Switzerland's Davis Cup final in France coming up next week. "We don't want Roger to win too quick and destroys Stan's confidence. The most important thing is that we beat the French." Federer was out on court a couple of hours ago hitting with coach Stefan Edberg, a match-up that had many tennisheads here drooling at the "what if" scenario that threw up. There was a healthy smattering of Swiss fans court side already, and the O2 Arena is once again creaking at the volume of red-and-white clad fans with 'RF' and 'Stanimal' branding emblazoned across them. I reckon we might get a cow bell or two as well. You can listen to live commentary from the O2 Arena on BBC Radio 5 Live Sports Extra. All you have to do is click on the live coverage tab at the top of this page, sit back and enjoy. Hello, welcome back for live text commentary of the second semi-final from the ATP World Tour Finals in London. I hope you enjoyed the football and rugby, and now it's back to the tennis. We already know world number one Novak Djokovic will be in the final, and that he will be playing a Swiss opponent in the final tomorrow. But which one? World number two Roger Federer takes on countryman Stan Wawrinka, fourth in the rankings. We should be set for a high-quality encounter. This should be good. Roger Federer and Stan Wawrinka have been in formidable form this year to help Switzerland reach the 2014 Davis Cup final. Next weekend, the pair will be hoping to guide their country to the title for the first time in their history when they play France in Lille. But that friendship will be put on hold for a couple of hours or so tonight. Team-mates become fierce rivals. Personal glory replaces national pride. Only one man can win.